Create an outstanding and unique trade show booth with our Rustic Wood Grain Foam Tile. This vinyl topped, interlocking foam tile is easy to install and provides a custom look for your trade show booth. This versatile flooring features an optional beveled edge. Our Rustic Wood Grain Foam Tiles are 2 x 2 ft, and 1/2 inch thick and are easy to disassemble and transport. These interlocking vinyl and foam tiles will provide fatigue relief for employees and potential customers. The beveled edge option will provide a safe edge and will reduce tripping hazards. The Rustic Wood Grain Foam Tiles can be installed over any hard, flat surface, transforming the space into your custom trade show booth. These tiles are available in Corner, Border, and Center styles and feature a durable vinyl top. For aerobics, activities do not place the tiles on top of carpeting, as foam tiles can shift. Add color and comfort to any room with the Foam Floor Mats 5/8 Premium tiles from Greatmats! These interlocking foam mats are ideal for kids play rooms, trade show booths, and nearly any indoor space that needs a soft surface for work or play. The premium foam tiles are available in 15 colors and feature a textured surface on one side and a smooth surface on the other. This gives you freedom to decide which type of surface works best for your particular application. The textured side of the foam flooring features a thatch design that is resistant to scuffing and provides extra grip. These mats also work well in exercise areas, where cushion and shock absorption is desired. Each interlocking premium foam mat is 2-feet by 2-feet in size, covering four square feet. They have a puzzle-edge border, which allows them to fit together easily and provides a firm grip. They are 5/8 inch thick, providing reliable cushioning while maintaining a light profile. Each tile weighs roughly one pound. Plenty of Colors, Limitless Potential! To enhance your flooring design, we have given you the option of 15 different colors. From bright tones like red, orange, and yellow, to neutral colors like tan, white, and grey, you can select the exact color for your area. When you start mixing and matching colors, the options become virtually limitless! Installation for these interlocking foam mats is fast and simple and you won’t need any special adhesives. If filling a room, simply start in one corner and work your way out evenly in all directions, using foot pressure to press the mats together. You can also align border strips in corners, along walls or exposed edges for quick and easy wall-to-wall installation. When you reach another wall or obstacle, you can use a sharp utility knife to cut pieces to size. Premium foam mats can be easily cut to fit any space using a sharp blade and a straight edge guide. Two detachable border strips are included with each tile, allowing easy transformation of the sides of your mats from a puzzle edge into a straight line for wall-to-wall or island installations. Create island layouts with finished borders by simply pushing the border strips into place at any desired side. Using the universal interlocking foam mat system, installation can be completed no time! These mats are a premium quality product made from ethylene-vinyl acetate (EVA) foam material, which helps convert a basement or den into a playroom or indoor sports area. With 15 color options, these foam floor mats allow you to mix and match, creating design patterns that will fit your decor and give you freedom for creativity and style. The universal interlocking design means you can mix and match tiles of different colors with ease. With the added benefit of our interactive online room designer, you can also save time in the planning process. Easily create scaled room layouts and color pattern designs with these versatile premium interlocking foam mats. When used as kids foam floor tiles, this 5/8-inch mat helps transform a kid’s bedroom or play area into a colorful, enjoyable and fun space. The foam not only provides great cushion for active children, but can also serve to muffle noise and provide thermal insulation. As an added benefit, the waterproof material is also resistant to stains. Lead and latex free, these kids foam floor tiles are safe for young and old alike. Mats for kids’ playrooms are safe, soft, and comfortable when they are created with premium foam mats. Your entire space can be filled with colorful puzzle mats, using the bright colors to create an amazing space. For those with curious children, the puzzle tiles are easy to lay down and rearrange; so easy, in fact, that your children can help design and redesign their own floors! You can also match the colors with your child’s bedroom theme. Whether you want calming colors for a bedroom or vibrant, energetic colors for a play area, the choice is yours. Whatever you decide, our interlocking foam mats in 5/8-inch thickness will be a wonderful addition children’s floor play areas in your home. Exercise rooms are another popular place for our customers to install premium 5/8-inch interlocking puzzle mats. Try our foam mat floor planner to design your layout to scale. When using a foam tile for an exercise room floor, you have a few things to consider. Will it be used under heavy furniture or machines? Will it be an open space for aerobics or martial arts-type activities? Will it be a multipurpose room? Typically, exercise equipment and heavy furniture will leave some indentation in the foam. This will not hurt the material, but you may want to consider using a pad, such as furniture coasters to help prevent permanent indentations. Be sure to install these interlocking mats over a hard, flat surface for aerobic activities. Interlocking foam floor mats are great for exercise rooms, but you may also consider an upgrade to our Home Sport and Play mat for additional cushion and versatility. This product is 7/8-inch thick and is available in three color combinations. Each Home Sport and Play mat features two different colors; one color per side. They are reversible, allowing you choose either color to display. They are lightweight and can usually ship via ground service. This can save money compared to freight delivery, especially for residential customers. Greatmats interlocking foam mats are easy to cut with a sharp utility knife for custom wall-to-wall installation. Foam mat flooring for basements can turn any hard, cold floor into a comfortable, warm, and soft surface full of color and life. Dull and hard basement floors can become comfortable and welcoming areas for increased activity and family time when an interlocking foam floor is installed. 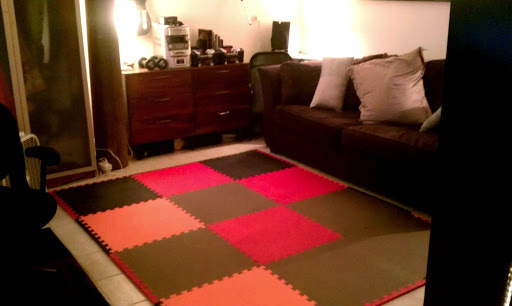 Bring bright color, design, and safety to your basement with Greatmats puzzle mats. These mats are waterproof and made of closed cell EVA foam. The closed cell material does not allow mold or bacteria from a damp floor to penetrate your mats. Our foam mats also act as a vapor barrier to any potential moisture coming up through a concrete floor and provide insulation against cold concrete, making it much warmer and pleasant for bare feet. Compared to large rolls of flooring, such as carpet or linoleum, the 2×2 foot interlocking design of the tile cuts down drastically on wasted material. When our customers must stand for hours at a time, they are thankful for foam mats, which are particularly useful in a trade show or events booth. It is easy to create a 10×10 foot trade show booth layout with 25 mats. A 10×20 foot trade show or special events booth would require 50 foam mats, while a 20×20 foot trade show booth will require 100 mats. Whatever the case, this foam trade show flooring will transport easily and install in a flash. Consider a hard, plastic cargo ready carrying case to transport and store your mats for years of use. We have many sizes of durable carrying cases for you to choose. They range in sizes from 2×4 and 4×4 feet and all the way up to cases that carry 200 mats for a 20×40 foot booth. This creates better convenience when moving the mats to different show locations. The Premium foam tile is complete with a one-year warranty against product defects. It can be expected to last for 10 years or more in normal residential applications when cleaned and cared for on a regular basis. Greatmats stocks thousands of square feet of this and similar foam flooring products, allowing for quick shipping on even the largest commercial and athletic projects. While most dents will come out over time, some indentations may become permanent. High heels or sharp objects can puncture the foam tiles. Do not place the tiles on top of carpeting, as foam tiles can shift. Cleaning for these interlocking foam mats can be done with basic household cleaning equipment. To clean the surface, you can run a vacuum over the mats, but be sure to test over a small space to make sure your vacuum won’t damage or scuff the mats. If necessary, you can clean the mats with a damp mop, using basic household cleaners and warm water. There’s no special equipment, and no massive time commitment. It’s another reason why these foam mats are so popular for home and commercial use! Color and shade may vary somewhat from tile to tile within the same order, this is common with this type of EVA foam material. Make a checkerboard pattern in your room to alleviate this potential issue. To find out what other options of foam, rubber, or plastic mats are available for your needs, contact us today. We offer a complete and comprehensive line of interlocking mats, and some foam tile products are even offered with free shipping! Browse our website to see our complete line of puzzle mats. If you have any questions, our flooring experts are here to answer your questions via phone, online chat, or email. We’ll be happy to talk with you so you can make an informed, confident decision! Here’s another great review, this time from Dannette M. Dannette purchased our 5/8″ premium foam mat which is an excellent, and economical, foam floor option for a variety of applications. Dannette used these foam mats as an office and workout floor. Foam mats are soft and warmer than hard surfaces. They are also waterproof. Available in 15 bright colors, they add fun and warmth to any room. These mats come with a one-year manufacturer’s warranty and should last for ten years or more in a normal residential setting. The 5/8” premium foam mats are our most popular product. These foam mats are so popular because of their versatility. We find that a large variety of people enjoy these mats. We sell them to both nurseries as playmates and to military bases for training exercises. 5/8” Premium foam mats are convenient and easy to handle because they’re so lightweight. This makes installation and breakdown remarkably easy. For wall-to-wall installations, the tiles can be easily cut with a sharp utility knife. When it’s time to relocate, simply stack them up and you’re on your way. Thank you, Dannette, for trusting Greatmats to help you find the perfect flooring solution for you. We appreciate your business. Built to withstand intense training with combatants in shoes and boots, the Martial Arts Pro is the granddaddy of all martial arts mats. Designed of high density, EVA foam, this mat is built to last for years. Great for combat sports of all types including boxing, MMA, and BJJ, they also work great as an aerobics flooring. This affordable foam mat material features a scuff resistant top-thatch texture that can take pretty much any punishment you can dish out. Used primarily for police and military tactical training, these mats are commercial grade. Large 40×40” tiles create fewer seams than the smaller home version of these foam mats. They are completely waterproof and can also be used in kids play rooms or multi-purpose rooms such as those found in YMCA’s. Try them in your basement for a comfortable and soft surface area to work out or just hang out on. They can be laid directly on concrete. 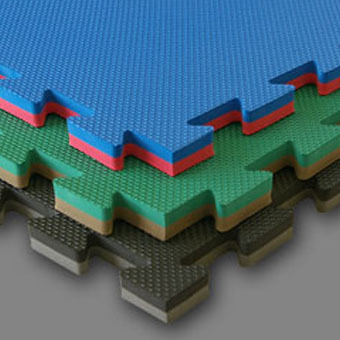 Interlocking edges on these foam mats allows for a quick and easy installation. Mats are lightweight and can be easily moved from location to location. No adhesive is required to create a stable and safe floor that provides the cushion needed for various martial arts moves including high throws. If you decide this isn’t the perfect martial arts mat for your facility, we encourage you to look into our complete line of interlocking foam mats. We have several different types of foam mats to choose from with some as low as 99 cents a square foot. Not sure what you need? Feel free to chat with us online, send us an email, or give our friendly customer service department a call. We are standing by to help you find the perfect foam flooring for your application. We are determined to not be undersold. If you should find a lower price for the same product (including shipping), we encourage you to please let us know. Designed specifically for indoor playground flooring, with a fall-height rating of 4 feet, these indoor play mats provide a welcome layer of safety for your facility. These colorful mats provide traction and comfort for kids and parents along with ergonomically friendly fatigue-relief. Indoor playground mats are lead and latex free. They are anti-bacterial and are made of closed cell EVA foam. No mold or bacteria from a damp floor can penetrate the foam. These mats will also act as a vapor barrier to any potential moisture coming up through a concrete floor. They are also waterproof. Each interlocking foam tile measures 40 x 40” x 1-5/8” thick. This floor requires no adhesive for installation. In fact, these foam tiles are remarkably easy to install. Simply lay the tiles down and piece their interlocking edges together. Easily cut the edge pieces with a sharp razor or utility knife for a perfect wall-to-wall installation. Border strips are also included. Because these mats need no glue or tape, you can bring them with you if you change facilities. Lightweight and easy to store, this flooring is really convenient and will provide a softer, safer kids play floor for years to come. These foam tiles come in four double-sided color options: Red/Blue, Black/Gray, Green/Gray, and Green/Yellow. Tiles are truly reversible so you have a variety of fun color patterns you can make. Let your imagination run wild! If this particular foam mat is not what you need for your facility or budget, please check out the rest of our foam flooring. 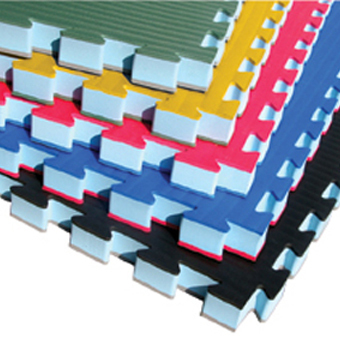 We offer a complete line of interlocking foam mats with some priced as low as 99 cents per square foot. If you have questions, feel free to chat with us online, send us an email, or call our friendly customer service center to speak with one of our flooring experts about our entire selection of foam mats. We look forward to hearing from you! A great choice for MMA training, Judo, BJJ and Jiu Jitsu, our grappling mats are designed with a durable tatami surface that will not cause skin burns while you are training. This is just one reason these MMA mats are used nationwide in professional studios and competitions. At a full 1-5/8” thick, they can take any abuse you can throw at them. Please note that these mats are designed for use with bare feet or soft shoes only. We also carry martial arts matssuitable for combat training in full gear and boots. Economical, easy to install, and waterproof, these interlocking grappling mats are available as a reversible MMA mat with colors on both sides. This allows for a multi-color design in your facility. These grappling mats are designed to be used directly on any hard flat surface including concrete without the need for additional padding. Simply lay these MMA and grappling mats down and interlock them together for a perfect fit every time. Installation is an easy wall-to-wall fit; simply measure and cut the grappling mats with a sharp utility knife. We recommend that you let your new grappling mats and MMA mats to acclimate to your room’s conditions prior to installation. Also, you will want to avoid direct sunlight on these grappling mats as the foam can expand with increased heat and humidity. If you’re not sure what type of foam flooring you’d like for your MMA training, you can request a free sample or a price quote online at our site. Use our online floor plan designer to lay out your new martial arts floor using grappling and MMA matsfor your facility. We are determined to NOT be undersold – please contact us if you are offered a better quote for the same product with shipping costs included.